Fatma Samba Diouf Samoura of Senegal has been appointed as the first-ever female secretary general of FIFA, President Gianni Infantino announced at the body’s Congress here today. Infantino proposed Samoura, who is the current United Nations (UN) Humanitarian Coordinator and United Nations Development programme Resident Representative in Nigeria, to be his number two at a specially-convened meeting of the FIFA Council this morning. 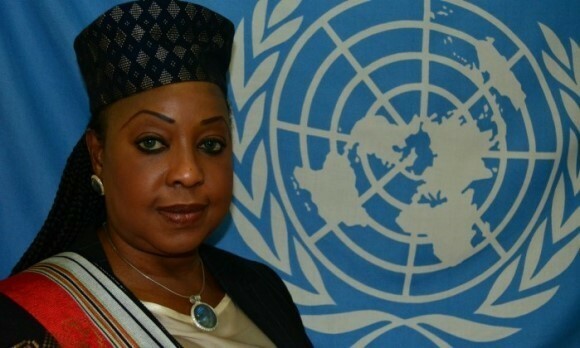 The ruling Council agreed with the historic appointment and Samoura will assume the role by mid-June as long as she completes an eligibility check. The Swiss claimed the choice to select someone from outside the traditional pool of footballing executives for a pivotal role within the organisation he now presides over was essential “as we continue to restore and rebuild our organisation”. “Fatma is a woman with international experience and vision who has worked on some of the most challenging issues of our time,” Infantino, who made the announcement during his President’s address to the Congress, said. “Importantly for FIFA, she also understands that transparency and accountability are at the heart of any well-run and responsible organisation. “It is essential for FIFA to incorporate fresh perspectives – from outside the traditional pool of football executives – as we continue to restore and rebuild our organisation. Samoura, who worked in the private sector in Senegal for eight years prior to taking up a position with the UN, is also the first non-European to land the FIFA secretary general role. The 54-year-old takes over the reins from Frenchman Jérôme Valcke, who was dismissed from the role in January and was then banned from all footballing activity for 12 years in February for a series of ethics breaches. Valcke, who oversaw the day-to-day running of world football’s governing body under former FIFA President Sepp Blatter, was found to be in breach of several regulations, including offering and accepting gifts and other benefits, conflicts of interest and confidentiality. “Today is a wonderful day for me, and I am honored to take on the role of FIFA’s secretary general,” Samoura said. “I believe this role is a perfect fit for my skills and experience – strategic, high impact team building in international settings – which I will use to help grow the game of football all over the world. Samoura is considered as one of the leading officials within the UN and has extensive experience in governance and is responsible for 2,000 staff members, and monitors and evaluates the security in Nigeria, as part of her current position. She has never held a position within any sport or sporting governing body, however. Her appointment is likely to be seen as a shrewd move as FIFA attempts to market itself as a federation which embraces gender equality, with the prominence of women within the top brass of the organisation a key part of the reform process, initiated in the wake of the corruption scandal. The Council, which has replaced the Executive Committee as FIFA’s ruling entity, must have six female members under the reform package. Previous articleHow Corrupt Can You Get?